Chris Urch’s The Rolling Stone is a powerful and deeply moving portrayal of being gay in Uganda, and of the consequences of sexuality for a young man and his family. Even the play's title is weighted with meaning; it comes from the newspaper that was circling in Kampala in 2010 which published the names, addresses, and pictures of people they believed to be gay. Many were killed or forced to flee as a consequence. Fiston Barek plays 18 year old Dembe, who has fallen in love with Sam, played by Julian Moore-Cook — an Irish-Ugandan doctor working in Kampala. Dembe’s family is deeply religious. 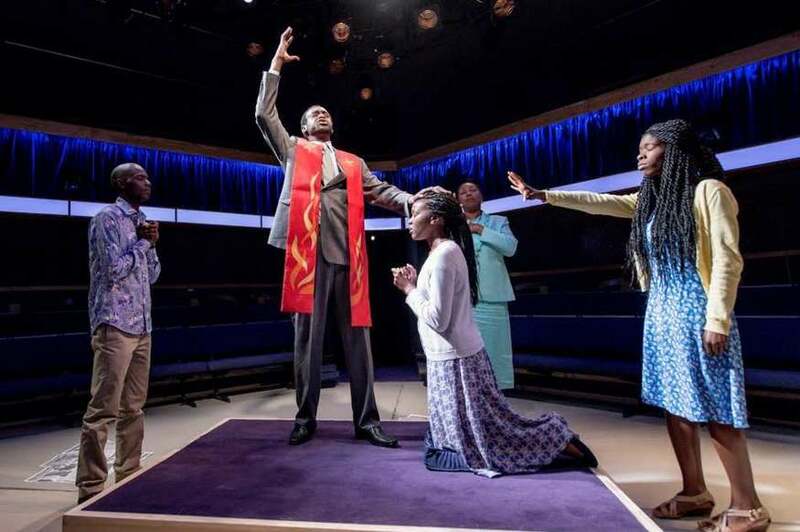 His brother Joe (Sule Rimi) is appointed pastor thanks to some behind-the-scenes encouragement from their neighbour and surrogate mother Mama (Jo Martin), whose daughter Naome (Faith Alabi) lost the ability to speak some six months ago. Dembe’s twin sister Wummie (Faith Omole) has, like Dembe, dreams of becoming a doctor, though she is willing to make sacrifices for her brother and family that Dembe is not. The performances are flawless; the family dynamic is such an honest one that it is hard to believe Barek, Rimi and Omole are not actually siblings dealing with the reality and responsibilities of adulthood after the death of their father. The use of song is mesmerising too, in the way it weaves through the action, the voices harmonious and used both to build and release tension in different scenes. In the simple space of the Orange Tree Theatre director Ellen McDougall has managed to create a production so atmospheric that you forget there is no set and few props. You forget, in fact, that you’re in Richmond at all. The Rolling Stone is on at Orange Tree Theatre until 20 February. Tickets £10 - £25. Londonist saw this production on a complimentary ticket.